Meet the permanent band members of Eclectic Verve. I’ve always enjoyed singing. As a young child and through college I sang in school and church – both as a soloist and as a choir member. I sang for enjoyment in the car and performed in front of audiences in my hometown, regionally, and all the way to Sweden. After college I became busy, pursued new interests, and left the music behind. I chose a career as an information technology project manager and oversaw large, complex, highly structured projects to manage. I excelled at managing all of the details to successfully execute projects. Along the way, I met and married Kent. I knew he had musical inclinations, but did not understand how deeply his talent was ingrained in his very being until several years into our marriage. 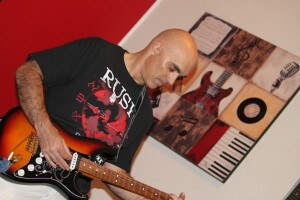 Kent reconnected with his high school band mates to collaborate on creating original music in 2008. Just as I was not fully aware of Kent’s talent for playing the guitar, he did not think of me as a vocalist, because I no longer sang. However, “Going to Colorado” on our debut album, Something on the Way, really needed a female singer, so I offered to help Kent with that one song. I entered a whole new realm in trying to hear a vocal line in my mind vs. reading a musical score. It was work in the beginning–I wanted everything to be perfect and it was hard for me to allow my creative voice to sing through. One song led to another. 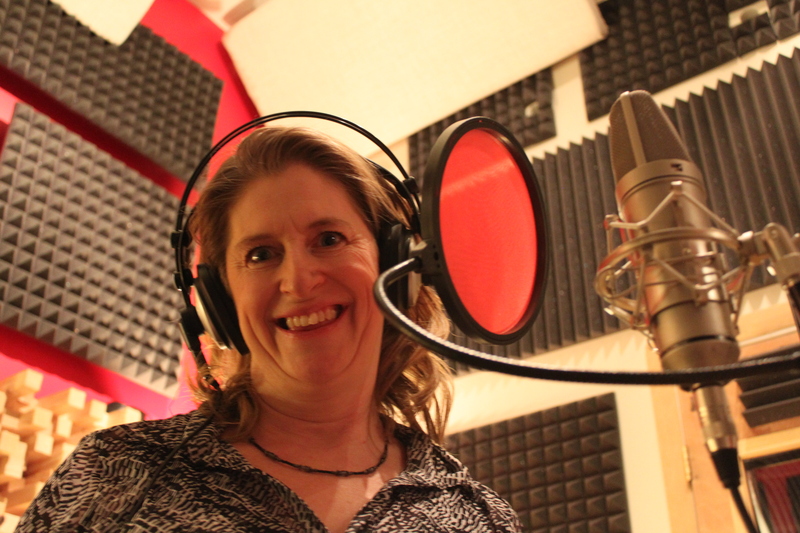 Then, out of the blue, when recording “Signs“ I hit my stride. I remembered that singing was fun. In 2011, as indie musicians, we embarked upon a journey that was vastly divergent from our path prior to the launch of Eclectic Verve. We have been so grateful for the support of friends and family in this new direction. In 2015, we released our second album. With our first album, we learned that our voices harmonize well together, so for our second project, we collaborated earlier in the creative process and to a much greater extent throughout the life cycle of the album creation process, which resulted in a larger vocal role for me on I Wanna, Iguana! I received my first guitar (a Yamaha Classical Acoustic) as a gift when I was 7. I wanted to play the John Denver songs that my family listened to a lot. I remember being amazed during my first lesson when my teacher played the songs and I thought, “It sounds just like the real thing!” I took lessons for several years off and on and got a good foundation for various styles including jazz and classical music. The style that really got me going the most was good old rock and roll. In high school, my brother Kevin and I formed a band with another classmate to play at a church talent show. The auditorium was packed with nearly 1000 people. They cheered when we finished and I was hooked. The band evolved throughout high school and became RPM with myself, Kevin, Erik and Carl. After high school, and a couple of demo studio recordings of originals, life got in the way of our rock star dreams and we drifted off on different paths and “real” jobs. I continued to play, although my music was more of a hobby and method of personal expression. After marrying Cindy and moving into a house together we were able to build a music studio in the basement. Something about this room created inspiration for me because I started writing again. While music has always been a release for me and a way to connect with my soul, I had not previously considered sharing the healing effect it had on me with others. After a reunion with RPM in 2008-2009, when we wrote some songs together for a potential CD project, I embarked on a solo project and christened Eclectic Verve. Most of the songs on our first album were written within a three-month span in the late summer and fall of 2010. Having Cindy contributing vocally to the music and working together on the project was extremely rewarding. With our second album, I took my songwriting in a completely new direction to create a collection of children’s songs. I had so much fun creating, playing, and singing these songs! I was able to allow myself to be a little silly and a lot more relaxed in developing these new tunes, but I’m also really proud of this body of work. Although these are quirky little ditties, I poured my soul into professionally crafting these songs into musical compositions of which I am extremely proud. I hope you receive as much enjoyment from listening to our music as I receive when I create music. We hired the following session musicians to record our debut album, Something on the Way, which was released June 11, 2011. Kevin is a walking click track. Just as I under-appreciated my husband’s musical talent, I had no appreciation for my brother-in-law’s talent. Unlike Kent, Kevin has stayed in the music realm – perfecting his craft through A LOT of practice, specialized schooling, teaching, and more late night gigs with various bands than he would probably like to remember. This focus has led to a true perfection of his craft. He was able to listen to the demo CD and intuitively hear what percussive treatments he wanted to incorporate into each measure of every song. I didn’t realize how important percussion was to a successful recording. I learned that without a solid percussive foundation, even the best guitar tracks and vocals fall apart. Luckily, we have a consummate professional in the family, so we were able to get all the drum tracks for all 12 songs recorded in less than 2 days. Carl is a recovering guitarist. 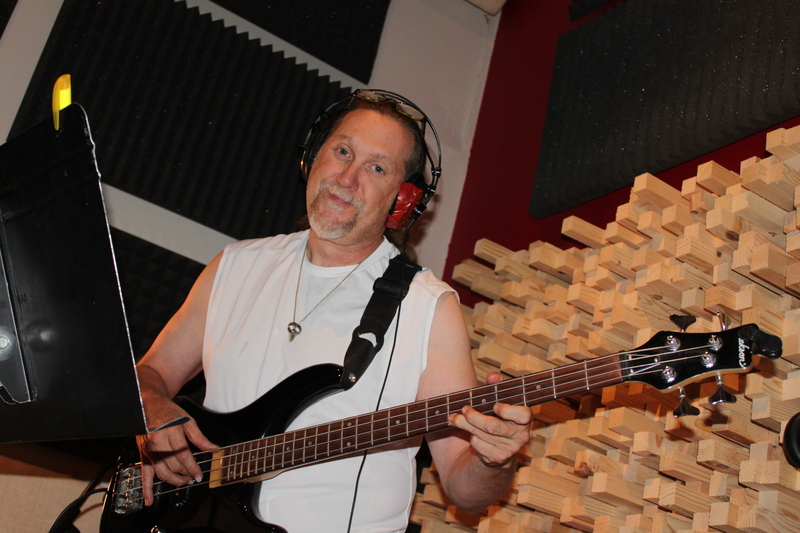 Serendipity brought the bass guitar into his life and he’s never looked back. He can pick a bass guitar with the best of them. Carl has this way of curling himself around his instrument when he plays in a manner that he becomes one with his instrument. I still can not figure out how he actually breathes all bent over like that, but it seems to work for him. 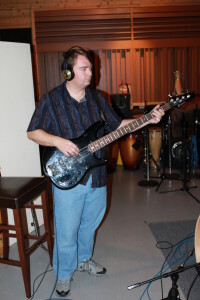 With the change in tenor of each song, Carl was able to bring out the most appropriate feel, making each bass line unique. As I learn more about the recording process, I have decided that percussion is like the cement foundation of a structure, and the bass guitar is analogous to the walls. Carl, like Kevin was a member of the high school / college band in which Kent performed. It was nice for Kent to collaborate with some of his old band mates for our debut album. Session Musicians – I Wanna, Iguana! We hired the following session musicians to record our second album, which was released on July 11, 2015. Darren is an incredibly talented musician and accomplished music professional. 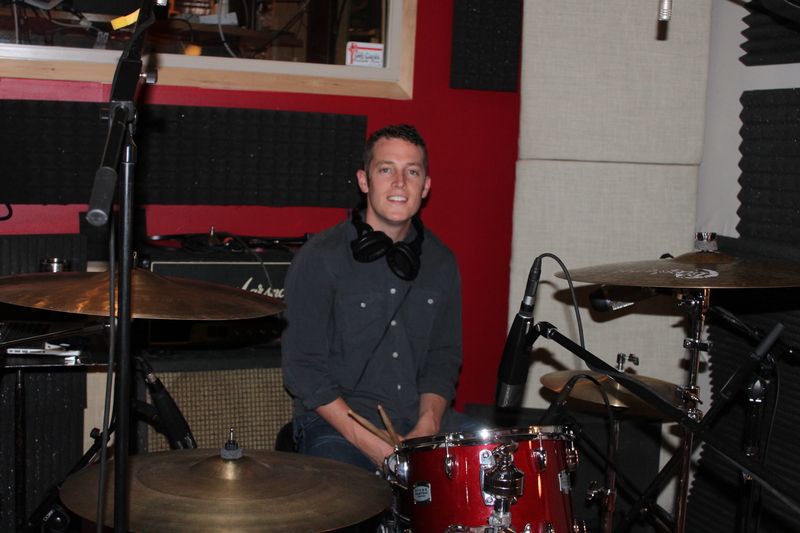 We hired Darren’s company, CCM Recording Studios to record, produce, mix, and master our EP. Darren and Kent have similar personalities in that both are fairly laid back, but are also passionate about music. When Darren isn’t playing the role of business owner, he’s performing with the duo Skanson & Hansen. Brandon is a consummate professional. 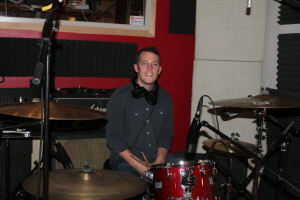 His interpretation of the percussion treatment for each song was true to Kent’s original intent. Brandon took the provided demo CD and added his own artistic flair. 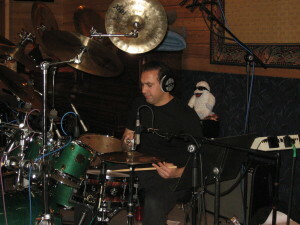 The result of his efforts is a collection of solid foundational percussion tracks. Brandon’s true love of music and his percussion talent shine through.